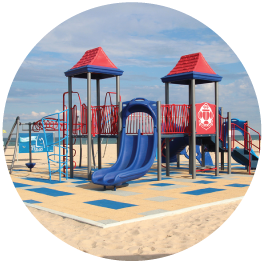 News from LMCU: LMCU-sponsored playground is ready for kids at Holland State Park! LMCU-sponsored playground is ready for kids at Holland State Park! It’s playtime! The heavy lifting is done and the ribbon has been cut. On Wednesday, August 17, the new LMCU-sponsored playground at Holland State Park opened to the sounds of laughter and excitement. Inspired by the drive of Holland resident (and LMCU member) Sally Starr, this new playground was facilitated by Carter Oosterhouse’s non-profit organization, Carter’s Kids. With a busload full of LMCU staffers lending the muscle, the playground went up in two days and is now ready to rock. Holland State Park attracts some 1.5 to 2 million visitors every year, and LMCU is proud to help give back to the communities we serve. Thanks to all who contributed or supported this effort!